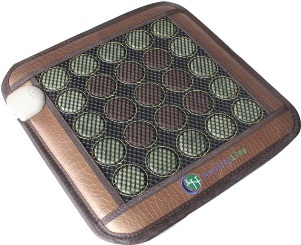 The InfraMat™ SmallPad-3JT-Mesh is a specially designed heat therapy pad ideal for targeting small areas of your body. The SmallPad-3JT-Mesh is made with high-quality jade and tourmaline stones to provide you with healing relief. Our New York-based American company HealthyLine™ acquires our stones from the world’s most abundant mines in northern China, puts each one through a rigorous seven-stage quality control process, and then registers them through the proper channels with the FDA, FCC, CE, and several highly respected U.S. laboratories. We take pride in our work and treat our products as works of art, which is why we only use real jade and tourmaline stones, with no colored plastic, to create the InfraMat™ SmallPad-3JT-Mesh. Jade stone has been renowned in China for centuries and is now convincing the Western health care industry of its profound healing and beautifying abilities. Jade cleanses the body of harmful materials, boosts the body’s immune system, and helps heal kidney, heart, and stomach ailments. Because of its unique restorative properties, jade was once thought of as the only type of bedding fit for kings during the Tang Dynasty. The InfraMat™ SmallPad-3JT-Mesh is fitted with these powerful stones not only for their therapeutic qualities but also because jade is the most efficient heat absorber of all the natural semiprecious stones. Tourmaline stones are a very rare, chemically complicated stone mostly mined in small Chinese villages. Tourmaline, like jade, has strong healing properties, as evidenced by the considerably healthier and longer lives led by those living in these small villages. These stones detoxify the body of waste, improve blood circulation, and provide relief from acute and chronic illness and mental health issues, such as depression and anxiety. The InfraMat™ SmallPad-3JT-Mesh from HealthyLine™ relieves stress and tension, muscle pain and stiffness, headaches, depression, anxiety and insomnia, and helps lower high blood pressure. Fitted with the purest jade and tourmaline stones in the world and optimized for your health, the InfraMat Pro™ SmallPad-3JT-Mesh is simply the best of its kind. Our high-quality heating pads can be used for health reasons or for pure pleasure. Either way, the quality of our products speak for themselves. So do your body a favor and grab a mat (and maybe one extra for a friend) today! Note: this is not a soft pad. It is stiff with a little flexibility. You can seat right on it, or put it behind your lower back while seating, or keep your feet on it, or lay down (putting it under any area of your body). Since infrared heat and negative ions penetrating through for several inches – you don’t need to wrap it around arm or shoulder. You can just put in user the concerned area. Product is FDA registered in USA. 16 pcs of 2″ (50 mm) diameter natural jade stones + 9 pcs of 2″ (50 mm) diameter tourmaline ceramic stones under mesh.